Some time ago, Rhodox, the creator of the famous Painterly Pack announced that he probably won't have time to dedicate towards the Painterly Pack. Is this the end? Fortunately it is not. Together we fans will continue the Painterly pack to the best of our abilities. Well, now even I do not have the time to really do any of this stuff. If anybody else would like to continue this project they may. You can find a download link below for the current version of the Painterly Continuation Patch. As of now, the patch is compatible with Minecraft 1.11. 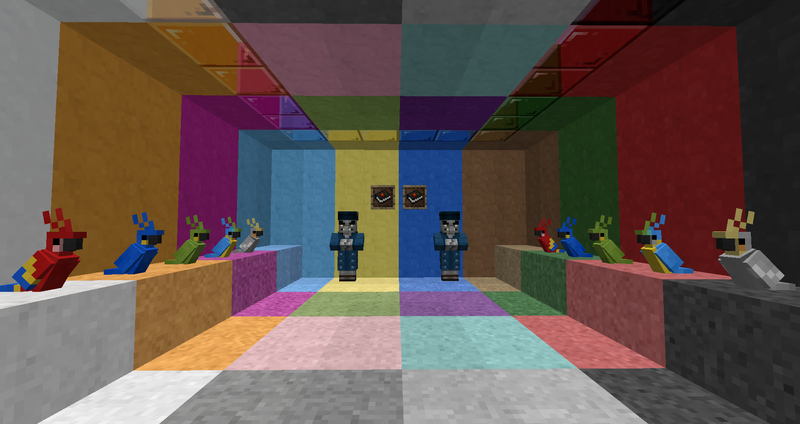 Here are preview pictures in order of Minecraft versions. Here is the download link to the patch. The patch is compatible with all packs made with the current Painterly Pack customizer. Customize yours to your liking here. 10/5/2016: Added llama decor, modified llama and polar bear skins, added command and structure blocks, fixed horse and shulker box inventories, tweaked a few textures. Patch - Changed the nether wart block texture to fit the vanilla theme more. More alternate textures have been added. Find them in the assets/alternates folder. Pack - Added biome colored water and ctm stained glass. Pack - Added random mobs support. Watch out for camouflaged creepers! 2/26/2017: Fixed patch download link. Added some textures for future 1.12. 6/5/2017: Fixed GUI stuff. Patch now supports almost all of 1.12's features. 10/19/2017: Updated concrete. Minor changes for 1.12.2. Cool, why has no one commented yet? Will you make a new website for customization? It's nice to see that people are dedicated to continuing Rhodox's work! I unfortunately cannot do that. 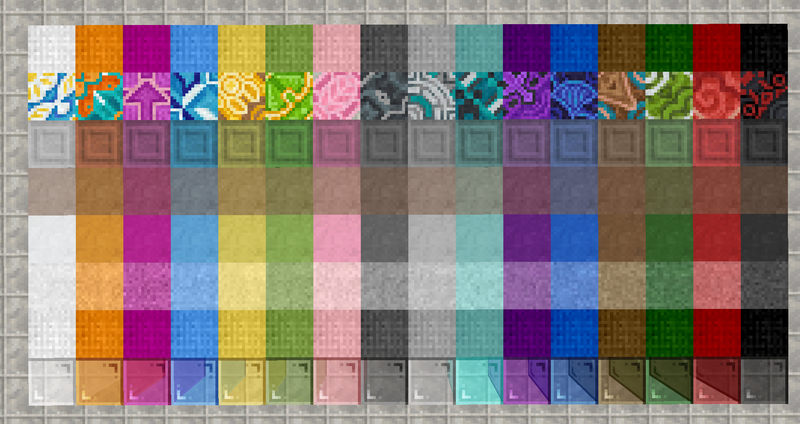 I can however make more textures that can be swapped with others in the pack if I have extra time. I also just recently updated the pack again. 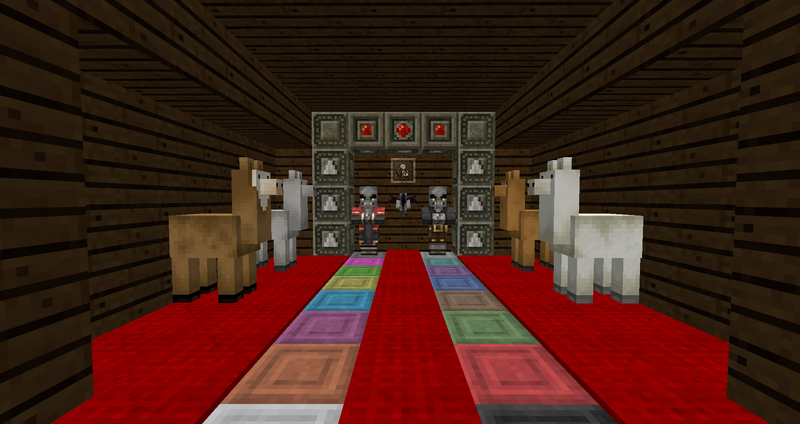 The llama decor has been done. The llama decor has the same patterns as the vanilla but have painterly wool textures used over them. The inventories for llamas and shulker boxes have been fixed. Boats are somewhat added. Command blocks and structure blocks are done. Also a few changes that I may have forgotten. I recall making a few tweaks here and there but nothing too big. 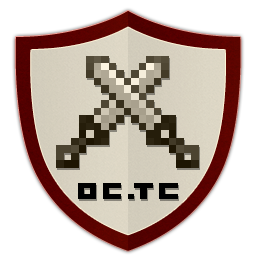 Edit: I'm also going to be making ctm textures for colored glass. It's extremely tedious so I'm only doing one set of textures. Honestly I have a bone to pick with the nether wart blocks. Even if it seems to be useless at first, it has several smaller uses in vanilla if you need that deep red color; you can use it as tropical fruit, gore or just a smooth-ish red block. Here, it seems like you only cared about theme. It doesn't really work anywhere, and considering that it's not a terrain block, that's a problem. Red nether brick could use some tweaking as well, not sure what though. I used textures directly from the painterly pack for those ones. I can make the Netherwart a deeper red. Red Nether Brick looks better when the default Nether Brick is darker but that would require overriding older textures. What bothers me is not just the color but the faces as well. It prevents some of the uses and basically limits it to "spooky" uses. If it stays light pink there could be a few different uses that aren't in vanilla, but the faces are what ruin it IMO. The color would be an amazing improvement as well, though. 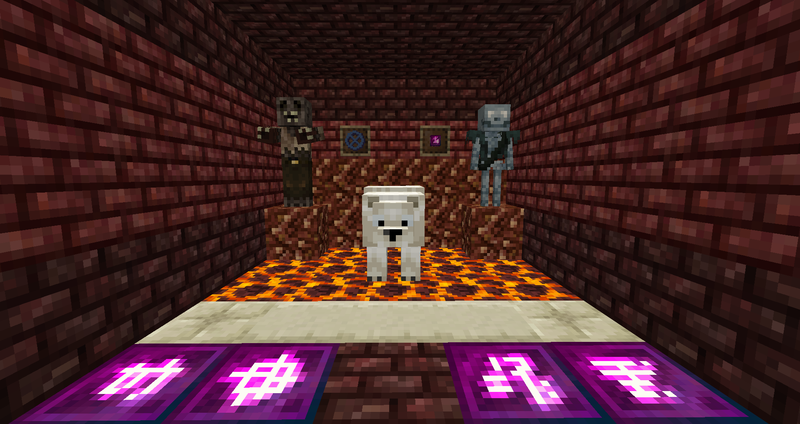 I'll add in some alternate textures for Nether Wart blocks then. 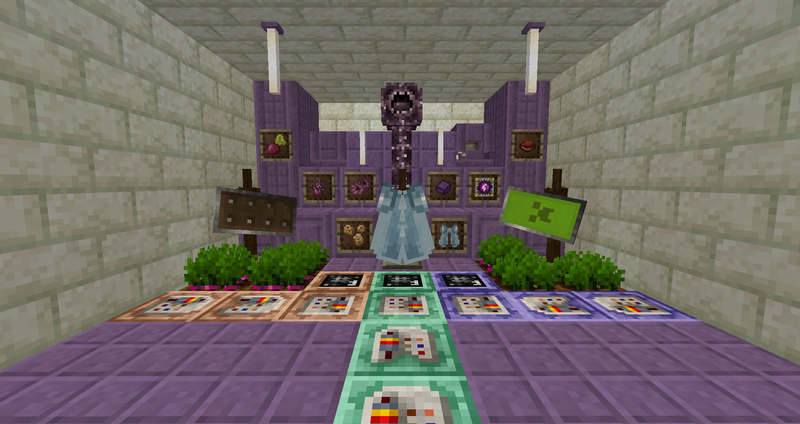 Next update is also including new structure blocks textures that use the Ender rune crystal textures. Edit: Changes have been made. I found a texture that looked really good as a nether wart texture. Enjoy! DL link is giving me an Error404...is there an updated link? Beware the Purple Monkeys!!! Beware!!! I'll fix that ASAP. I'll also make it 1.12 compatible. I'm mostly having trouble with the concrete mix blocks. I also won't be making anything big for the terracotta blocks as they seem fine as is (although if somebody submits anything more painterly styled then I will gladly add it to the patch). Edit: I think I have something worth sharing now. What do you think? Okay, the patch's download link should be fixed as well as updated to 1.11.2. If you encounter any issues just post here and I'll get it fixed. painterlypack.net is down. Is there any way to download Painterly Pack anymore? I would post a download to the full painterly asset pack but mine's tainted with edits. It's the closest thing you can get to for customization. Besides that you can ask around for complete downloads such as mine. Nice to see this updated! The Painterly Pack website is back up! 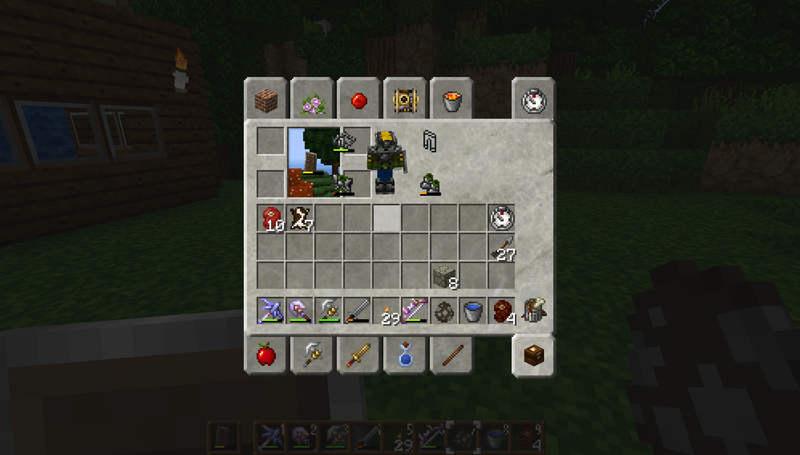 Just FYI, the creative inventory screen is all jacked up with the 1.11 patch.